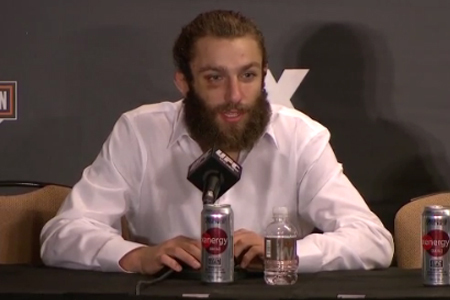 “The Ultimate Fighter: Live” may not have generated the ratings the UFC was hoping for in its first season on FX, but you can’t blame Michael Chiesa (Pictured) for that. The bearded brawler capped off one of the most dramatic runs in the reality series’ history by winning the lightweight tournament following his father’s death after just a couple weeks into taping. Chiesa entered Friday’s fight as nearly a 3-to-1 underdog, but managed to submit Al Iaquinta with a rear-naked choke at 2:47 in the 1stRound to win a six-figure UFC contract. Oh yeah, he also pocketed an extra $40,000 for ‘Submission of the Night,’ a three-fight sponsorship with TapouT and a Dyna Street Bob Harley-Davidson motorcycle for good measure. “The Ultimate Fighter: Live Finale” took place inside The Pearl at Palms Casino Resort in Las Vegas, Nevada.